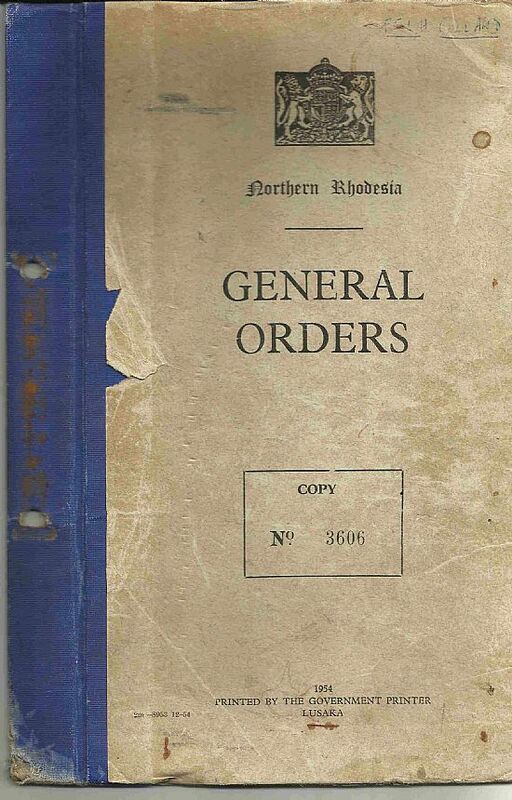 When the country was Northern Rhodesia, every new government employee was issued with a copy of "General Orders". click on "Cil-Col" in the left hand column, then scroll down to near the bottom of the List, you will see the name "Collard, F.E.L.H." Now, Mr. Collard was one such Civil Servant, and when he became an employee of the Northern Rhodesian Government, he was issued with a copy. Under the Regulations, he should have returned this copy, failure to do so will have made him liable to a payment of £1.1s. This document was scanned by his son, Edward Collard, for which, many thanks. It is being transcribed (all 104 pages), and will be shown on here in due course - the sole purpose of the WebSite. You will see Collard's name faintly inscribed at the top right of the Cover. The sole purpose of this WebSite is to make this historical document, the NRG General Orders, available on the Internet, as searchable text, so that search engines can find it. Apart from the "text" version shown here, the document is also available as a "Facsimile" in searchable .pdf files (click on the LIBRARY tab on the left) or as WORD documents - just ask (CONTACT US Tab on the left). We concede that the format displayed is not the prettiest - but that is not the point. This WebSite is provided FREE, but is restricted in the number and the size of the files that may be uploaded. Chapters will be added as they become available - check out the NEWS Tab on the left of your screen. So far, only the Contents and Chapter 1 are present. There are 11 Chapters, and then 69 Appendices. Please notify us of any transcription errors. This WebSite is provided FREE, and is paid for by the ads that you see below and on your right. If you click one of those links, you will be taken to their WebSite.